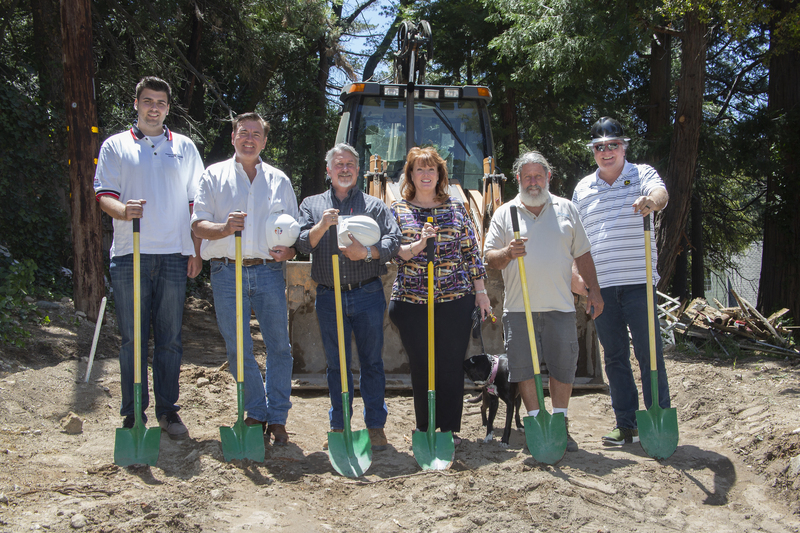 The ABC Green Home 4.0 project build in Crestline, California is now underway. We had our ground breaking at the beginning of the summer with our Builder Steve Bates, our architect Chuck Goodman from IPDA Global, and Civil Engineer Bryant Bergeson from Kadtec. To achieve our ground breaking we first had to demo the 1946 built home that was on the site, in order to make way for our build. We applied for and were granted a major variance so we could relocate the foundation north and east within the property lines of the flat and well-treed 8,500 square foot lot. During our planning and approval process, the San Bernardino County planners office went through a major staff realignment, making our approval process last ten months, which is rather more time than a typical custom spec home would ordinarily take to approve. We came into plan check with all 69 pages of our plans ready for the Net-Zero, LEED, EPA Water Sense build in hand. The folks at the planners office thought we were building a space shuttle. Not a lot of Net-Zero homes are being built in the mountains in Southern California. In fact we are the first, although assuredly due to the recent building code changes, not the last. After demo and removal of the previous structure, we set the grade and formed for our retaining walls and slab, which are being poured in two installments, once the underground plumbing is completely installed and inspected. After curing we will seal the walls, back fill with sand, pour the slab above the Stego sourced vapor retarding barrier, and go vertical with our first floor framing. The cameras should be live on the website for the pour, see www.abcgreenhome.com for the web cams. It is worth noting, we were able to recycle a considerable amount of material from the original structure, including windows, lumber, and red brick, some of which will be used in our build. We also removed 16 cedar and maple trees from the site, which were logged, dried and then sent to a local lumber mill to be planked, to provide material for our build. Cedar lined closets, to be specific. After demo and removal of the previous structure, we set the grade and formed for our retaining walls and slab, which are being poured in two installments, once the underground plumbing is completely installed and inspected. We build these special Net-Zero homes in order to demonstrate best practices in high performance American home building design, technology, and construction, using materials made available exclusively by the advertisers in this magazine, our Product Partners. Look for the ABC Green Home Logos on their ads. These are the same folks who are in the supply chain you may already be using. The point being, nothing made from unobtanium is included in our builds. All of the parts you need to source in order to create Net-Zero Energy homes are readily available today, and are on the shelf at your local Builders Supply Yard. The residential design, engineering and consultant community are well versed in energy efficiency and can provide straight forward designs for high performance walls, ceilings, attics, and basements that align perfectly to Net-Zero construction. We have found the manufacturers are especially up to speed on building science and can offer a wealth of knowledge and information regarding materials and applications to achieve specific energy goals within your more energy efficient homes. Our builds also incorporate other features which dovetail with our efficiency and comfort theme. We borrow from the 55+ community playbook and create wider doorways and corridors, lowered work stations in kitchens and bathrooms, thoughtful placement of plug receptacles and switches, flush entry showers in master baths, and swing open tubs for folks with disabilities. Automatic night lights illuminate a nocturnal bathroom visit and we include a self contained multi-gen suite featuring a bedroom, kitchenette, bathroom, and living room. The popular in-law suite option is helpful for aging parents, or for any monster-in-the-basement returning children. Whether it is a simple programmable thermostat, or a more advanced whole home solution like our partner ELAN offers, there are a lot of choices you can offer your homebuyers that will not break the bank to include in their home and more importantly, will help set your communities apart from your competition. Despite some unexpected and unwelcome delays our unique 3,100 square foot 5 bedroom, 5 bathroom mountain build is now underway. We are grateful for the hard work and patience of the design team, the construction team and our generous advertisers, without these folks and the support of SoCal Gas, a Sempra utility, we would not be able to develop these Net- Zero demonstration homes to share with you. Many thanks to all of these folks, it really does take a village. We welcome your thoughts, I can be reached via email at the address below. In the meantime, please monitor our progress online via the webcams.